Along with nearly two dozen top Indian American officials of his Administration, present in the room with President Trump was his daughter Ivanaka Trump. and said he is “grateful” because of his friendship with Prime Minister Narendra Modi. Trump said before lighting the ceremonial Diya in the historic Roosevelt Room of the White House. “We’re trying very hard to make better trade deals with India. But, they’re very good traders. They’re very good negotiators. You would say right. The best. So we’re working. And it’s moving along,” Trump said referring to the India-US trade deal negotiations that have started between the two largest democracies of the world. 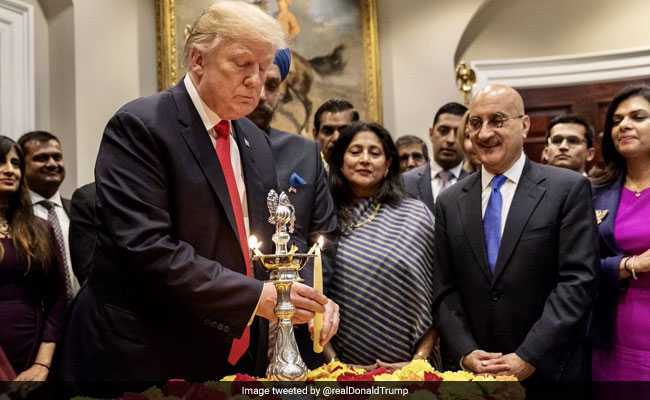 his wife Dr Avina Sarna, and his special assistant Pratik Mathur to be present during the White House Diwali celebrations. “I’m honored to host this beautiful ceremony at the White House. Very, very special people. We’re gathered today to celebrate a very special holiday observed by Buddhist, Sikhs and Jains throughout the United States and around the world. who never attended the celebrations in person. A senior administration official represented him. It was mostly held in the India Treaty Room of Executive Office Building, which is part of the White House complex.